Naples was famous throughout Europe in the 17th century for the variety of musical performances that took place during the course of the church year. Christmas was one of the feasts that was celebrated with particular splendour. 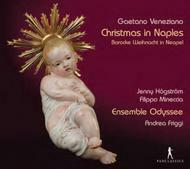 On the present CD, the Ensemble Odyssee under the direction of Andrea Friggi introduces Nocturnes and Pastorals composed by Gaetano Veneziano (1656-1716) for the liturgy of Christmas services. At the turn of the 18th century, Veneziano was one of the most important Neapolitan composers in the area of sacred music. Beginning in 1678 he was a member of the Cappella Reale, the direction of which he took over as successor to Alessandro Scarlatti in 1704. The music of the Christmas pieces recorded here is notable for great richness of invention and particularly festive sounds. The vocal soloists are the young Swedish soprano Jenny H�gstr�m and the Italian countertenor Filippo Mineccia. The pleasant timbre of their voices and their unaffected performance style are eminently suitable to this cheerful and colourful music.